Al Gore’s new film, An Inconvenient Sequel, was released on July 28th, but the managers of both major theaters in Waco have said they are not certain if this film will be shown. The manager at Regal (Hollywood) was very helpful and suggested that we request at the corporate website. Please join us in contacting the corporate office of Regal and requesting that the documentary be shown in Waco. Scroll to very bottom of page and click on "private screening/showings"
See "contact" at the top of page and click. SEPTEMBER 1 THROUGH OCTOBER 1, 10AM UNTIL 9PM, CLOSED MONDAYS. Theme of exhibit is climate change. Pieces may focus on the impacts, such as increased temp, melting ice sheets, rising sea levels, flooding, worsening drought, superstorms, ocean acidification, coral bleaching, species extinction, migration of people who lost homes, conflicts between nations. May focus on efforts to mitigate, such as renewable energies, sea walls, floating cities, etc. These are just a few suggestions, but many more are possible. The goal of the exhibit is to inform and educate local citizens about climate change, emphasize the urgent need for action, and inspire citizens to take action. The venue is a small restaurant. Art for wall hanging is preferred, such as paintings, sketches, photography, mixed media. Small sculpture to fit on a shelf or table is possible. Please limit size of piece to 18x24 inches. Since the venue is a family restaurant, material should be suitable for children. If you plan to submit a piece to the exhibit, please email me now, and specify the estimated dimensions of your work and the media if known: anorthc@aol.com. Please submit ASAP, as space is limited. If all space is full, some pieces may not be displayed. Please bring art for set up on August 31st. Title and artist name with price should be provided. Judging will be performed. The winners will be announced at the showcase Sept. 16. The awards are: 1st place $1000, 2nd place $400, Peoples' choice $400. 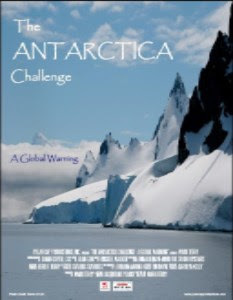 The Antarctica Challenge: A Global Warning is the FOP/C film selection for the month. This award-winning film reveals many startling new scientific discoveries, such as penguin suicide, new vegetation growing in the world's largest desert, diminishing populations of land animals and marine life, and dangerously increasing melting of Antarctica's land ice. This was the only film selected for screening at the COP climate meeting. From September 1, 10:00 AM, until October 1, 9:00 PM (the entire month of September), Waco Friends of Peace/Climate will host an art exhibit. The location will be Terry and Jo’s Food for Thought, at 1121 Speight Ave in Waco. Admission will be FREE. Reusable shopping bags (kind to our climate) will be available for FREE. 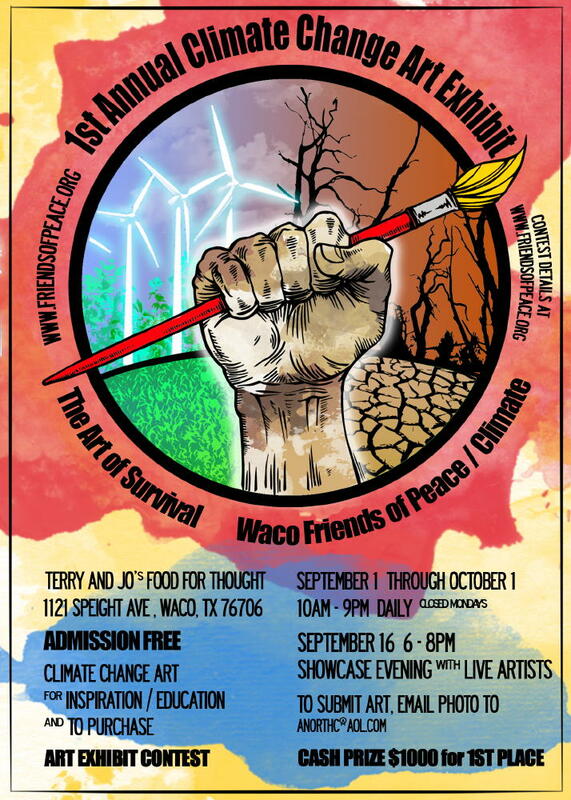 Saturday, September 16, 6-8 PM, will be the showcase evening, with artists and Waco Friends of Peace/Climate members present. There will be a scientific presentation, with wine and dessert, as well as classical guitar by Frank Exum. Science tells us anthropogenic climate change is the existential threat of our time. Art provides the emotional expression of this environmental emergency. ARTISTS: please submit a piece to this show. We explore impacts such as sea level rise, droughts, floods, famine, coral bleaching, ice loss, species extinction, and superstorms. The human costs & solutions are additional appropriate topics. Your works may also be sold at this show. Please email a photograph of any piece you would like to submit: anorthc@aol.com. Please join us as artist or guest at Waco’s first art show on this vital subject.